As baklawa lovers we were disappointed to find that this type of cake/dessert was only available at Christmas in a few supermarkets. Over and above the product could be weeks or even months old. 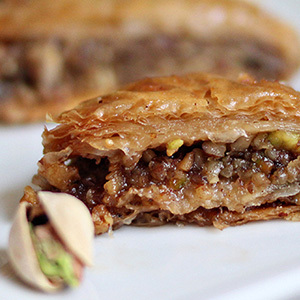 Therefore we began our business by introducing freshly made baklawa to our online customers. We despatch each order from the freshly baked produce every day. This has proved to be very popular and we are pleased to say that the baklawa can and does travel very well through the postal service. If there are ever any issues with the delivery or the product itself we are more than happy to resolve any concerns that customers may have.